Day after day, we’re flooded with attacks from Donald Trump and right-wing extremists who target Elizabeth, our progressive values, and even the very fabric of our democracy. We know how frustrating it can be to watch. But we’ve also seen people step up and fight back like never before. 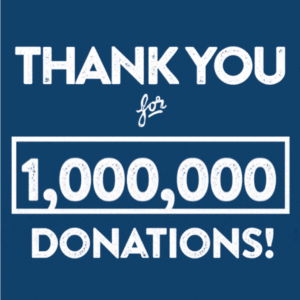 And we’re happy to share a bit of good (even HISTORIC) news: we just received our one-millionth contribution to Elizabeth’s re-election campaign. THANK YOU! We’d like to give a very special shout out to Lynne, a public school teacher from Massachusetts, for contributing our one-millionth donation. As a mother of two daughters, Lynne told us that she is concerned about the future of women’s rights and the direction of the American education system. She chipped in to our grassroots campaign this week because she believes that Elizabeth is an honest politician who’s standing up to the big corporations and special interests that dominate Washington. Elizabeth has been fighting for people like Lynne – hard-working people from across Massachusetts and around the country – ever since we elected her to the Senate in 2012. But this has never been just Elizabeth’s fight. It belongs to everyone who signs a petition, makes calls, knocks on doors, shows up to a rally or town hall, shares a video, and – yes – donates $5 or $10 to our campaign. We’re able to keep the pressure on Donald Trump and his right-wing cronies because of supporters like Lynne – and you. This is a huge milestone for us – we couldn’t have done it without our supporters.